Surprisingly comfortable eh? You are looking at one of the best values in Yamaha’s 2007 line-up. 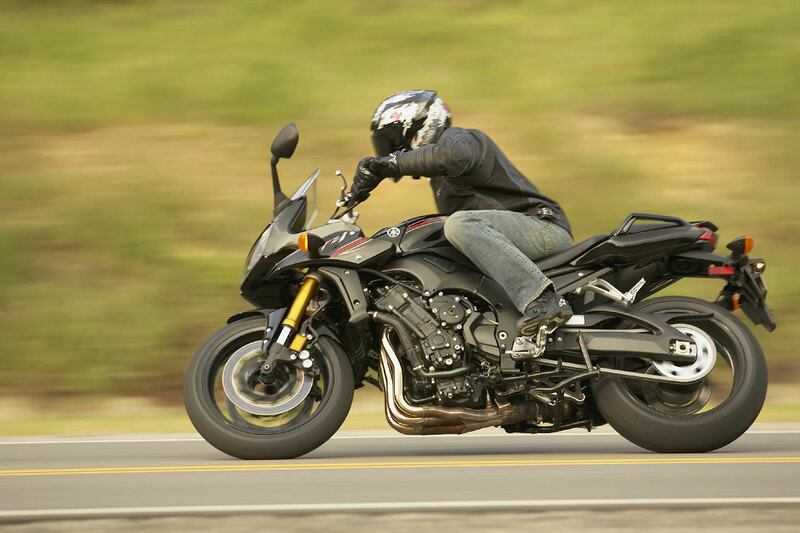 The FZ1 offers exceptional open class performance with cutting style. 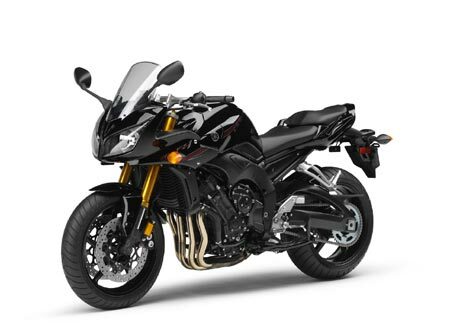 R1 inspired power, fuel injection, twin spar aluminum frame and fully adjustable suspension. The FZ1 is a serious sport bike that offers an exceptionally comfortable and exciting riding experience. – Ultra-lightweight 998cc, DOHC, 20-valve, liquid-cooled, 40 degree inclined, in-line four-cylinder engine produces 150 hp at 11,00rpm. The engine has been tuned to provide outstanding performance and incredible passing performance. – The crankcases, pistons, cylinder and cylinder head are based on the 3rd generation R1 powerplant (’04 to ’06). – Combustion chamber design and squish area has been optimized for maximum sports performance. 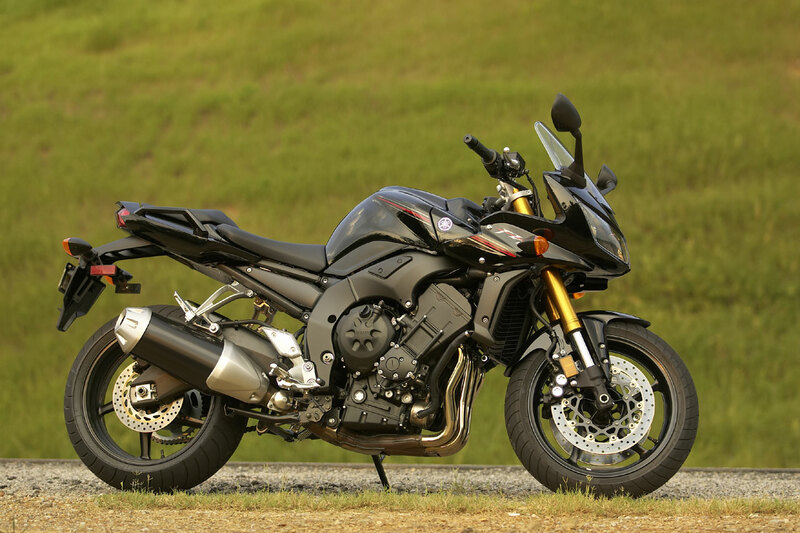 The compression ratio for the FZ1 is 11.5:1. Redline is set at 12,000 rpm and features a “soft” rev limiter to protect the engine. – Special lightweight, high lift, high performance intake and exhaust cams help to provide incredible horsepower and fast engine response. Both the cam profiles and the cam timing are slightly different than the 2006 R1 to provide for more low to midrange power. – Lightweight, 3rd generation R1 based crankshaft provides quick engine response. The inertia moment or mass of the crank has been increased by aprox. 40% (Vs 2006 – R1) for improved low to mid range engine performance. – Connecting rods are carburized and use a nutless design. The lower end “cap” of the rod is made from the same piece of material as the upper portion, this design is known as “fracture splitting”. This design aids establishing true big end roundness and greater precision in con rod dimensions. – Closed deck cylinder design allows the cylinders to be spaced more closely together, allowing a narrower engine. The cylinder block is a stand-alone part. The benefit if this design is improved sealing, and easier serviceability. – Ceramic composite cylinder “bores” are a “liner less” design with the ceramic coating sprayed directly on the aluminum block to ensure great heat dissipation for consistent power delivery, reduced friction and reduced weight. – Short skirt, lightweight forged piston design features special ribs in the piston pin area for great rigidity. – Smooth shifting 6-speed transmission features optimized gear ratios for maximum performance in the “real world”. 1st and 2nd gear ratios are the same as the R1, while all other ratios have been revised. 5th and 6th ratios are wider for reduced engine rpms at highway speeds for more relaxed cruising. – Compact, heavy duty, multi-plate clutch ensures consistent, positive engagement. – This design uses coil springs (5) and paper based fiber plates (9) to reduce weight. 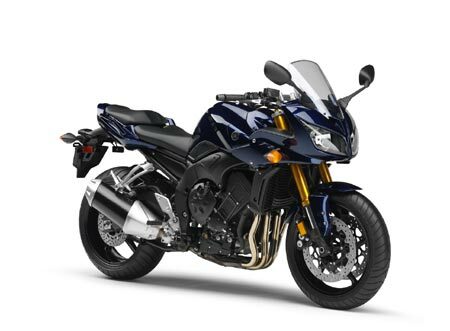 – Mikuni fuel injection system is based on the 2006 R1 design, featuring 45mm throttle bodies fitted with T.P.S. (Throttle Position Sensor). This style of fuel injection uses dual valve throttle bodies with motor driven sub or secondary throttle valves for optimum throttle response. – The actual injectors are Denso “long nose” type injectors with a high dynamic range and 4-spray holes for excellent power and response across the entire rev range. – Specially designed 8.2-liter air box with intake air temperature sensor maximizes performance. A viscous type air filter is utilized. 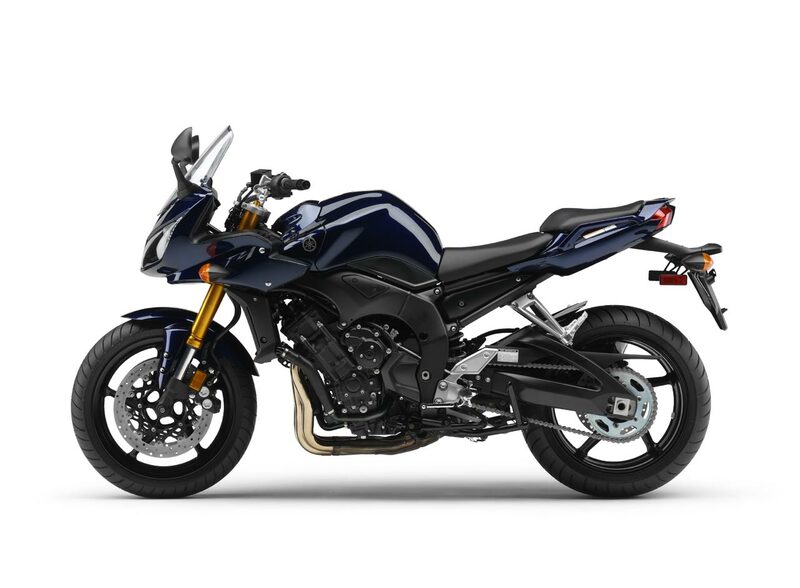 – The fuel injection’s lightweight Electronic Control Unit (ECU) utilizes a powerful 32-bit processor for faster control of the injection process. The compact design also reduces weight. – Yamaha’s patented Exhaust Ultimate Power Valve (EXUP) monitors engine rpm and adjusts exhaust flow for maximum performance at all rpms with no flat spots. This system also optimizes fuel economy and reduces emissions. – 4 into 2 into 1 exhaust system features chamber-less, stainless steel exhaust pipes and a short design silencer / muffler. The header pipe length has been optimized for maximum power delivery. This system is fitted with two 3-way honeycomb catalyziers with an oxygen sensor to reduce harmful CO and HC exhaust emissions. This EXUP valve is a single axis design. – High-efficiency curved radiator features compact dual ring-type fans for maximum cooling efficiency. This rad and fan design produces more airflow than conventional flat design rads to maintain optimum engine temperatures for consistent power output. The curved design also allows a shorter wheelbase. – Maintenance-free transistor-controlled digital ignition ensures great performance at all rpms. – Air Induction System (AIS … not ram air) reduces harmful HC and CO emissions for a cleaner environment. – Die cast lightweight aluminum twin spar frame provides an optimized rigidity balance for incredible sports handling. The engine is a stressed member of the chassis, allowing a lighter main frame design without sacrificing stability and light, agile handling qualities. – The riding position which is one of the most important features of the FZ1 offers a balance between a sporty riding position and great rider comfort. – Key chassis geometry figures include: 51% front and 49 % rear weight balance, 25 degrees of rake and 109 mm of trail. The 47 degree lean angle highlights the FZ1 sporty side. – Lightweight, detachable rear sub frame allows easy access to rear suspension components and reduces costs in the event of a “loop-out”. – C.F. (Controlled Filling) die cast truss-type rear swingarm is similar to the one used on the R1 and offers great rear wheel control and traction for razor-sharp cornering and superb stability at speed. The long 629mm arm helps to minimize the effect of the chain tension on the bike’s handling. – 43mm Kayaba inverted cartridge style fork is fully adjustable and offers 130mm (5.1″) of wheel travel. This fork features independent damping adjustments for compression and rebound via a one way port that separates the two functions. Adjustments include: spring preload, 26-way compression damping and 26-way rebound damping. 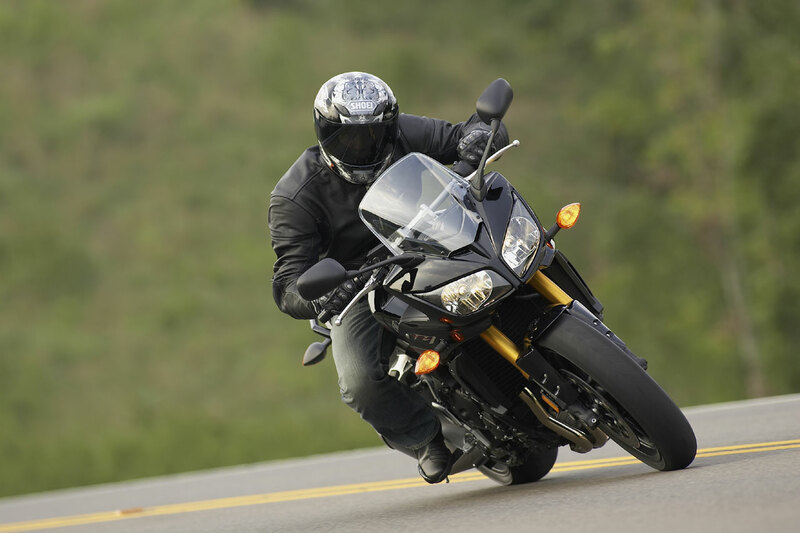 The adjustable design allows the rider to tailor suspension settings to match rider weight and road /track conditions to maximize handling and suspension performance. – Lightweight aluminum upper triple clamp features a 25mm offset for sportier handling. – 320mm dual front discs are squeezed by ultra rigid R6 inspired monoblock, 4-piston calipers which provide outstanding stopping power and lever feedback. The master cylinder utilizes 16mm piston for outstanding stopping power with less lever effort. – 245mm rear disc is squeezed by a lightweight single piston slide-type Nissin caliper with sintered metal brake pads. – Lightweight cast-aluminum 5-spoke wheels reduce unsprung weight for great handling characteristics. The front wheel is an MT3.50-17 and is fitted with competition-spec 120/70-ZR17 tire, while the rear wheel is a MT6.00-17 fitted with a wider 190/50-ZR17 rear radial. 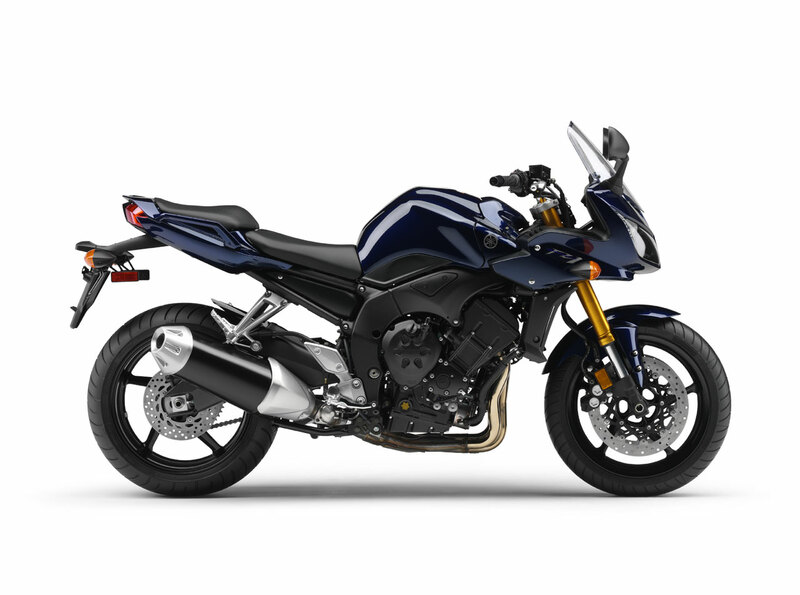 – Eye catching, half fairing offers surprisingly good wind and weather protection. It features R1 inspired dual “cat eye” halogen headlights. – Conventional handlebar design features a more upright positioning for maximum everyday comfort. – 18-liter fuel tank offers a slim design with great knee grip. The reserve portion of the tank is 3.4 litres. – Separate rider and passenger seats offers exceptional solo or two-up comfort. – One-piece instrumentation features analog tachometer, digital speedometer, dual tripmeters, fuel gauge, clock and new outside air temperature display. The back lighting on the instrument can be adjusted to suit the rider’s preference. – Excessive lean angle engine cut-out switch.